Now a toast of the progressive community, Ferguson views the law as a profoundly moral enterprise. 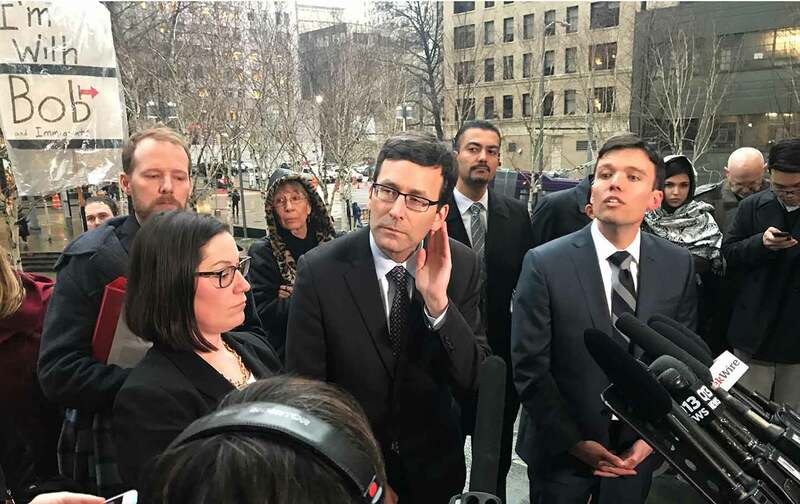 When Donald Trump signed his January 27 executive order, “Protecting the Nation from Foreign Terrorist Entry into the United States,” which temporarily halted the entry of citizens from seven Muslim-majority nations, as well as slamming the door shut on refugees, Washington State Attorney General Bob Ferguson was ready. When the order was unveiled, Ferguson was meeting with other Democratic state attorneys general in Fort Lauderdale, discussing likely challenges they would face from the Trump administration on immigration law, civil rights, environmental regulations, and other key policy areas. Following the meeting, Ferguson, a canny strategist who spent his youth as a high-level competitive chess player, twice winning the Washington State championship, immediately put a longstanding response plan into action. Within minutes of the order being signed, Ferguson’s team—including an expanded civil-rights division, which he had prepared over the past several months for just such a moment, and which had been in contact with Democratic attorneys general nationwide to work out how to respond to such actions—was poring over the text, looking for legal weaknesses that could expose it to a constitutional challenge. By the time he returned to the West Coast the following morning, the legal wheels for a court challenge were firmly in motion. Civil rights groups responded with elation, the Trump administration with fury. In a series of wrathful tweets, the president impugned the integrity of the “so-called judge” and argued that blood would be on Robart’s hands if a terrorist attack were to occur. Six days later, however, a panel of judges from the Ninth Circuit Court of Appeals upheld the ruling, and Trump’s team had to go back to the drawing board, as they sought to craft a creeping ban on Muslim entry into the country. In the wake of the rulings, Washington’s attorney general has become the toast of the progressive community. Ferguson, a low-key man who, unlike the president, clearly dislikes the bells and whistles of celebrity status, was suddenly thrust into the international spotlight. A man who spent a year after college as a Jesuit volunteer directing an emergency shelter, who volunteered as a tutor in after-school programs, and who worked in Guadalupe, Arizona, as a volunteer on a Native American reservation, he is, you might say, an anti-narcissist. He wants to be measured by tangible results rather than by spectacle. “He’s got this Catholic social-justice thing going on,” says his old University of Washington friend Peter Jackson, who used to drink microbrews with Ferguson at local breweries on University Avenue, where they would discuss politics and also sports; and who has, more recently, been on long walks with Ferguson around Green Lake, the North Seattle neighborhood near where Ferguson, his wife, Colleen, and their young twins live. On those walks, the friends discuss life and values. “Throughout his public career, he always takes pretty significant risks for the greater good,” Jackson continues, talking of how his pal has campaigned for an assault- weapons ban and an end to the death penalty, even though neither of those issues are particularly popular statewide. Ferguson is a remarkably humble, private man, a fourth-generation Washingtonian who got a law degree from NYU in the early 1990s and then immediately returned to his home state to be near his family—he is one of seven children, and grew up in a family in which his father, the breadwinner, worked as a manager at Boeing—and longtime friends. He is, those close to him remark, strikingly uninterested in material possessions. Until recently, Ferguson drove a battered blue 1993 Honda Civic to work every day, a car that was retired only when a teenage driver—a person younger than the car itself—delivered a coup de grace by smashing into it on a local road. Yet anti-materialist is not the same as anti-ambitious. He is also a man who has, throughout his life, set difficult goals for himself and then pushed as hard as he possibly could to realize them. When he was 10 or 11 years old, and just starting out on his chess career—Santa Claus had given him a chess set the previous Christmas—Ferguson’s father asked him to write down on a piece of paper his goals as a chess player. “I asked him why. He said if you don’t write your goals down they will never happen.” Ferguson wrote down that he wanted to win the state championship. Eight years later, he realized his goal. Some would say that Ferguson is obsessive: After college, he and a friend, both of them committed baseball fans, drove around the country visiting every single Major League baseball stadium. His favorite, to this day, is Fenway Park. Later, he began an even more single-minded project, setting a goal to hike the highest mountain peak in all of the fifty states. It’s an accomplishment that he is still, in the little spare time he has, pursuing, often hiking solo up perilously steep terrain to notch up another summit. Wyoming’s Gannett Peak particularly inspired him with its beauty and its isolation; Mount Adams, in his home state of Washington, served up little but thunderstorms and a good drenching. But it’s not just altitude that inspires the attorney general; he has also, on occasion, pushed his body to the limit trekking into canyons and off-the-beaten-track desert areas. Ann Ferguson, Bob’s older sister, recalls how he once hiked down from the North Rim of the Grand Canyon—and, on a whim, did so without a guidebook or tent. He went as far as 20 miles, Ann recalled, before a rock fall forced him to turn back. Earlier this year, Ferguson, a soccer fan who used to play pickup games with friends using garbage cans as improvised goals, and three college buddies flew to Europe to see how many premier-league soccer games they could see in one week. The answer, six: five in England and one more in Spain. There is, however, nothing that has occupied as much of Ferguson’s time over the years as chess. As a school kid, he would frequently neglect to do his homework so he could spend more time on the game. He’d often spend entire weekends studying strategy, chess books spread out around his bedroom. It is, consequently, tempting to reduce all of Ferguson’s legal acumen to a metaphor about chess: how he memorizes all the possible opening arguments, how he prides himself on being able to calculate, and defend against, his opponents’ countermoves; how he is not only a brilliant middle-game tactician but a master at the endgame. Yet such an explanation for Ferguson’s choices and methods is incomplete. Ferguson doesn’t view the law as a series of intellectual exercises or simply as a power game of win/lose, but rather as a profoundly moral enterprise. He was, relatives recall, strongly influenced by an uncle, Bill, who was a Jesuit priest. “Your life doesn’t matter if you’re not out there trying to do something good in the world,” Ann says of the ethos they were imbued with as children. It is this sense of moral integrity that fully explains the outrage Ferguson feels whenever the president fires off another bigoted tweet, or tries to strong-arm the political system into accepting another brutal executive order. Ferguson isn’t a grandstander. He didn’t get into this game half a decade ago to engage in endless legal battles with the Commander in Chief. Like most attorneys general, he sought the position because he believed he could use the law to improve the lives of his state’s residents. Yet he now believes that over the coming years a huge part of his job will involve taking on one unconstitutional measure after another from the Trump White House.